It starts with sautéed onion and garlic, which get caramelized and tender. Then we add the jackfruit (which mocks chicken) and cook until lightly browned to create texture and flavor. Next comes chipotle peppers, smoky spices, and vegetable broth. We’re onto something good, friends. 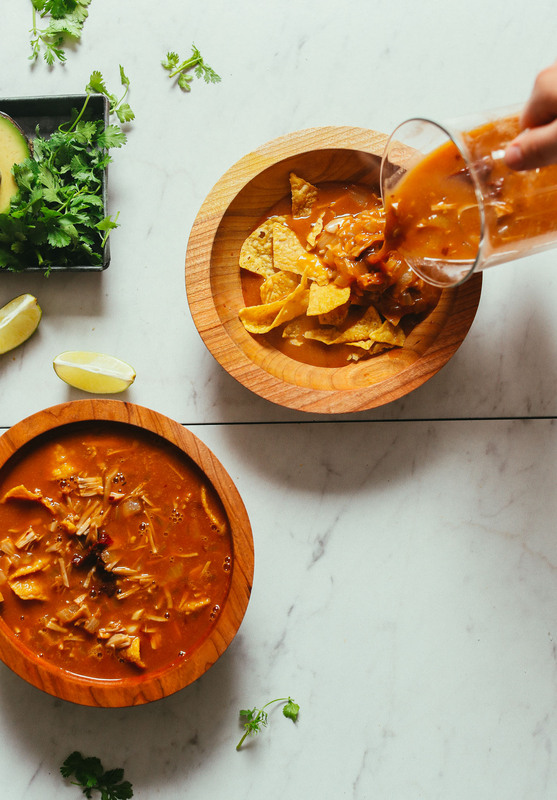 Simply let simmer until slightly reduced and toast your tortilla strips (or, if you’re like us and feelin’ lazy, use your favorite tortilla chips)! This would make the perfect side or appetizer on Mexican night. 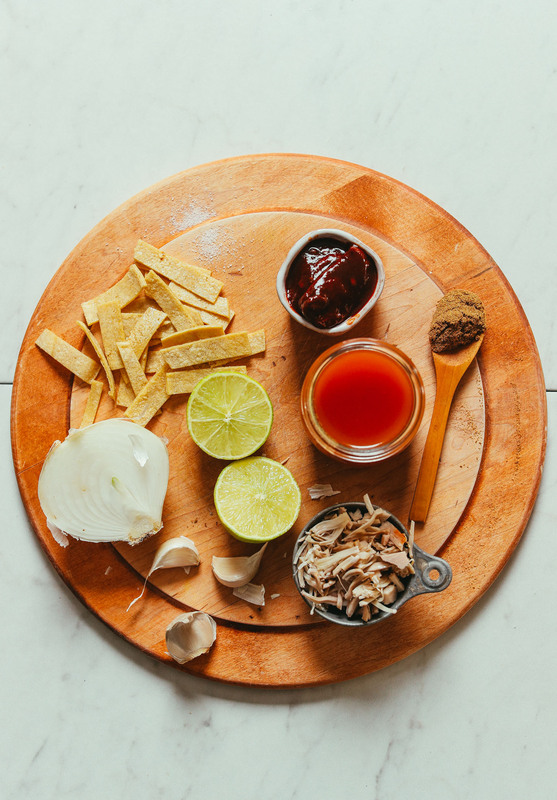 We love garnishing ours with toasted tortilla strips (or chips), fresh avocado, a little lime and cilantro. Swoon! 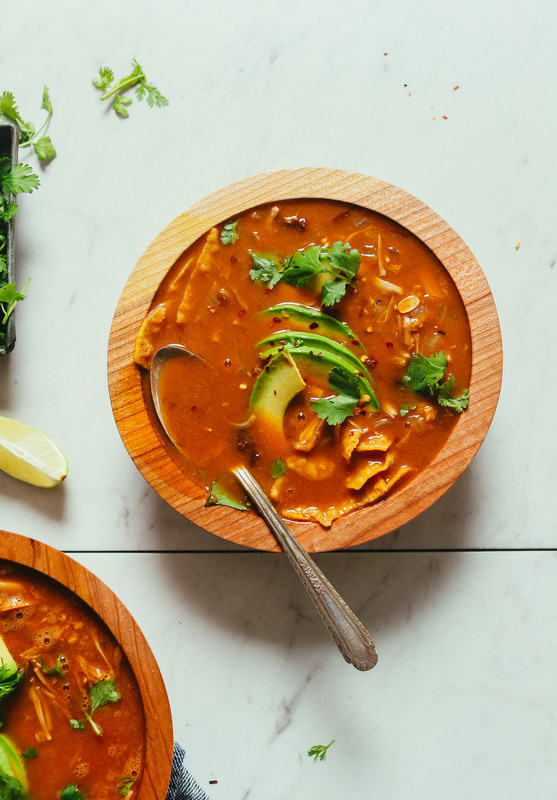 For more recipes like this one, check out these 14 Easy Vegan Mexican-Inspired Dishes! If you try this recipe let us know! Leave a comment, rate it, and don’t forget to tag a photo #minimalistbaker on Instagram. Cheers, friends! 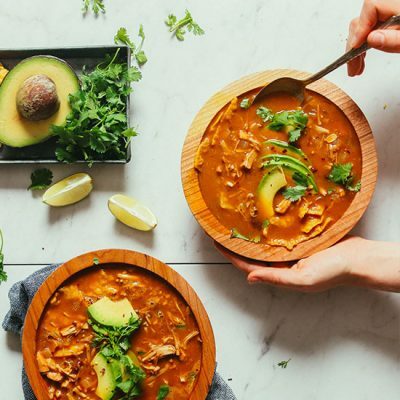 Brothy, vegan tortilla soup made in 1 pot! 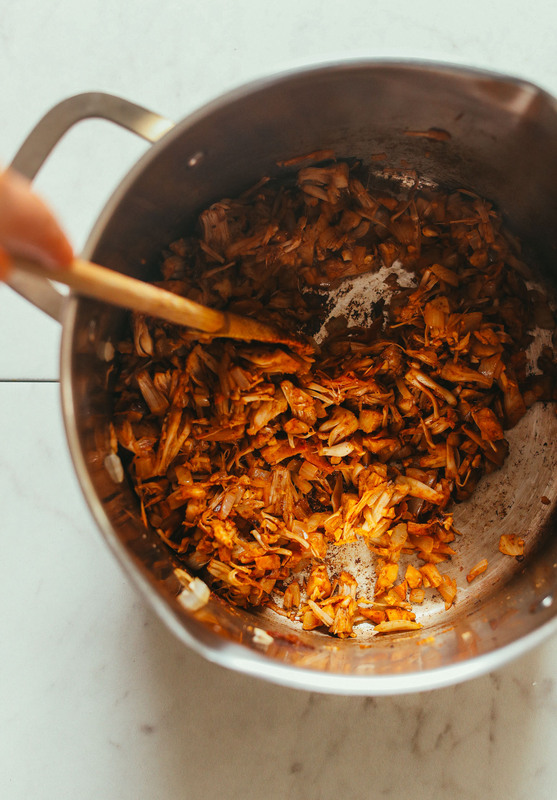 Shredded jackfruit is infused with garlic, chipotle peppers, vegetable broth, and lime. A hearty side or entrée for Mexican night. Thoroughly rinse and drain jackfruit. Then begin sorting. The pieces come in chunks or triangle shapes. Cut off the center "core" portion of the jackfruit that's tougher in texture and separate it from the rest of the fruit. Then chop into smaller pieces. For the remaining portion of the jackfruit that appears more stringy, use your hands (or two forks) to pull into small shredded pieces. You're aiming to separate the jackfruit into small, shredded/chopped pieces. Rinse the jackfruit once more in a colander, drain, and thoroughly dry. Set aside. *1 20-ounce can of jackfruit yields roughtly 1 1/2 cups of drained jackfruit. I recently started eating vegan for health reasons so I’m new to using jackfruit as a meat substitute, but it sure works great. I made the recipe for my dinner tonight. I used broth for the sauteeing and, since I don’t care for the taste of canned chipotle chilis, I used a little chipotle powder and Penzey’s Arizona Dreaming. The soup seemed a bit thin, so I reached for a can of black beans but all I had was a can of black bean soup, so I threw that in. I was so sad when I realized that I didn’t have any cilantro in the house!! Next time I will make sure that I have cilantro and a can of black beans before I start! I used tortilla chips for serving, along with the lime, avocado, and sliced radishes. Yum!! This made an excellent meal that was nutritious and highly satisfying. SO glad you enjoyed this, MaryJo! Thanks for the lovely review! I’ve made this soup twice and LOVED it both times. You think I could do it in a slow cooker somehow? To have ready when I get home after a long night working? Any tips? We haven’t tried that, but think it would work well! I’ll admit, I was skeptical about this recipe. The ingredient list was so simple I wasn’t sure how it would turn out. But it was good! My kids eat vegan on a regular basis, but I wasn’t sure how they would react if they knew it was jackfruit instead of chicken. Ignorance is bliss. They ate it just like regular chicken tortilla soup and never complained. I did use only 1 chipotle pepper and that was a good spice level for them. I also think if were to make it again I would add jalapeño, carrot, and celery to the soup. The toppings (tortilla chips, lime, avocado) are essential. Thanks! I used most of the exact ingredients and exact measurements. The only ingredient I didn’t use exactly was the chipotle chiles in adobe sauce. I used three tablespoons of Frontera chipotle in adobe sauce where the peppers are already ground down. I simmered mine for 15 minutes but the veggies were not soft yet. So I added a bit more sea salt, cumin, and a dash of garlic powder then simmered for another 15 minutes. It was perfect! Served over store bought tortilla chips and a squirt of fresh lime juice. This soup is AMAZING! I added one can of pinto beans and used no-chicken broth and a little tomato paste. I don’t usually love really brothy soups as I prefer chunky soups but this one was so good and sooo satisfying. I will definitely be making it again! Nice Recipe, Thank you for sharing. Best wishes from Deslyfoods. Yum! I doubled the broth and spices and added 1 1/2 cups of mixed black and pinto beans and one small diced squash just because I had stuff to use it. It was amazing! I’m trying to reduce the amount of chips I’m eating (thank you football season) so I also julianned some carrots for serving for extra crunch. A hit with both kids and husband, too. What a simple, but yummy recipe! I used Trader Joe’s canned jackfruit and this soup came out great. I though the lime and cilantro were essential garnishes that really elevated the flavor profile. Will make this again! We made this for the second time tonight and it was just as delicious!! We add rice to the bottom and the chips to the top and it mixes the texture a bit. I only use 1/2 an adobe (no seeds) and it’s the perfect flavour for my 8 year olds – they devoured it! I made this tonight according to the recipe. It was really lovely and I served with tortilla chips and soft tortillas that I toasted over an open flame. There was plenty of heat which my husband and I love, but I’m going to try a non-Spicey variation just to see how it tastes. Delicious! Thanks for sharing. We’re so glad you enjoyed this recipe, Tina! I looooove this soup – especially the smokiness and variety of textures. Made two batches this week to warm up after shoveling. Thanks, Dana! This was so very easy and really yummy. Everyone loved it. I couldn’t find jackfruit that wasn’t already flavored, so I used No Evil Stirfry “chicken”. I made this soup for New Year’s Eve and we all love it. The explosion of flavours is exceptional. it is so easy to made, one that will become a favourite confort soup, for this winter evenings. The flavor was great. I had leftover taco jackfruit that was actually a recipe from your blog I think! My problem was the spice. I added four peppers and some of the adobo sauce from the can..oops it was a little overboard. Suggestions on cooling it down?!? Thought about watering it down but not sure that’ll help much. It’s pretty spicy. Hi Richelle! You could use cashew cream to cool it down (similar to sour cream in a soup or chili) Starchy foods like potatoes or rice are also great to tone down the kick. This is so flavorful and satisfying. I did add 1T of tomato paste, a diced red pepper, corn and black beans to make it more of a main dish, and it was absolutely fantastic. As a bonus, I’m currently on Weight Watchers, and the base of this soup comes out to zero points (without oil, avocado, or tortillas). I have a hard time finding chipotle in adobo sauce (but when I can find it, I use it) I have substituted fire roasted peppers and Peperoncini piccante and it is really good too. (I used tutto calabria). Love so many of your recipes! Thank you! Smart! Thanks for sharing, Klarissa! I added 2 cans of black beans and two cans of roasted diced tomatoes and it was super good would definitely recommend adding in tomatoes! Yum! Thanks for sharing, Caroline! The directions were confusing to me saying to saute after the broth has been added… I had to drain the broth off to go back and saute. It would be helpful to clarify how much broth goes in for sautéing. Loved it though!! First time trying Jack Fruit…. Thanks! I knew this recipe would be good, only because all of Minimalist Baker’s recipes are, but I had no idea it would be *this* good. I was blown away by this soup. I made it exactly as the recipe stated but added some corn. I’m making it for dinner two nights in a row. One of my new favorite soups! Thanks Dana! My husband and I made this recipe and again I’m blown away by how savory, delicious and satisfy this soup is. We would recommend this soup! This is one of my favorite recipes of all time from the site! It’s very easy and has minimal clean-up- not to mention, delicious. I recommend some shredded jack cheese on top if you’re not vegan. I had more corn tortillas, chipotle peppers, and jack cheese afterwards so I made it a second time without jackfruit, adding black beans and canned tomatoes instead. It’s a very adaptable recipe! I do recommend a veggie broth that resembles chicken broth (or just chicken broth) as I think it works better than a tomatoey veggie broth. I have made this and doesn’t look like yours. Your broth looks thick and red. Mine is rather pale (water and broth cube) and the soup doesn’t look very appetising now. Any suggestions how to make it look more like yours next time? This depends on the brand of vegetable broth you use. We use Imagine (our favorite) or make our own, which both have tomato paste. Add some tomato paste next time for more flavor and color! Do you use jackfruit instead of like chicken or protein? Or what is a good replacement? Hi Isabelle! 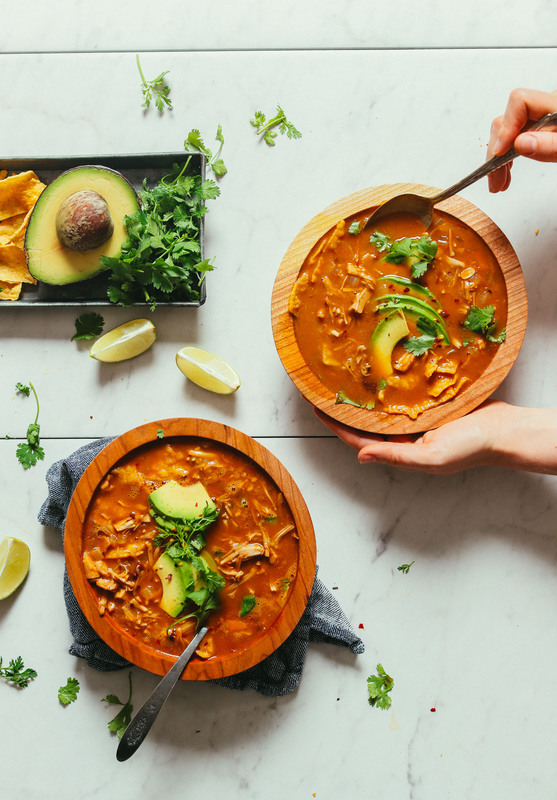 Yes, we are using jackfruit in this recipe as a plant-based alternative to chicken or another meat. That being said, jackfruit is not protein-rich food and you could always add black beans or chickpeas to this recipe for a boost in protein! This was absolutely delicious and easy to make. I liked the advice about how to cut up the jackfruit. I didn’t rinse it twice and I’m not sure what the benefit of that step is. Thanks for sharing, Andrea! Rinsing the jackfruit just helps neutralize its flavor. But it sounds like your technique yielded good results as well! I made this last night and it came together quickly and beautifully! I made it exactly as suggested but added double the amount of cumin and chipotle in adobo, and added one can of black beans for some protein. Next time I might add some corn as well! Quick, easy meal to throw together! Thanks! I had some extra veggies (corn & kale) laying around so I added that halfway through cooking along with some black beans. I also had leftover avocado crema (from https://minimalistbaker.com/sweet-potato-black-bean-enchiladas/) that I drizzled on top which created such an amazing, creamy texture. Will definitely be making again! AMAZING. Thanks for sharing, Katie! Delicious, simple and spicy! Boyfriend loved it! For sure I’ll be making this many more times! Thanks! I was a little skeptical of this recipe because I had never cooked with jackfruit before but I made this soup for dinner tonight and it was SO GOOD. Thank you Dana! Your recipes never disappoint. I made this AMAZING SOUP, and it was approved by my non-vegan friends! I added two yellow squash and a can of beans….DELICIOUS!! This will now be a good staple in my household! Yum! I made this with two chipotle peppers. I was worried it would be too spicy for my husband, but he loved it. I did add a can of rinsed, drained black beans during the last eight minutes of cooking. I wasn’t serving it with anything else and wanted to make it a bit more filling. Excellent recipe! This was one of of the best soups I ever had. I added potatoes as well. Thank you. This is the recipe that finally got me to try jackfruit. I love it! Its meaty and absorbs all the delicious Arbol flavor. I added more onions, frozen corn, 2 cans of black beans, and a lot more chilis. I didn’t think it made it too spicy. So excellent. thank you for making me adventurous. I live in Spain where it’s nearly impossible to find jackfruit in my city, so I tried using hearts of palm instead. I just pulsed it in my food processor a few times to shred it and it worked great! Yay! Thanks for sharing, Jen! Made this tonight and it was really, REALLY good! Only adjustments to make is to maybe add some crushed tomatoes and black beans like others mentioned! My broth was a little watery and I noticed you said yours had tomato paste in it…so I might add a bit of that the next time just to thicken it! All in all though making this recipe with the exact measurements and instructions came about perfect. So good with cilantro, lime and avocado. Thanks Dana !!! Great! We are glad you enjoyed it, Elisa! I love how easy this was to prepare, and that I finally had a recipe for my canned jackfruit. I couldn’t add as much of the chipotle peppers and adobo sauce as I would prefer because my children are sensitive about “spicy” foods, whereas I love lots of heat. I added one can of drained and rinsed black beans, and on a whim, I also added pieces of small baked potatoes to the soup. This kicked everything up a notch. I think the soup would still be delicious sticking to the suggested garnishes, but because of picky eaters, I omitted topping with cilantro and just had sliced avocado on the side. The biggest compliment is that both of my teens ate without complaint, and neither asked if the soup had “real chicken” pieces! Whoop! Thanks for sharing, Michelle! The addition of jackfruit is really interesting. I’ll definitely have to try that. I’ve made tortilla soup dozens of times. I always like to cut fresh corn tortillas into strips, then fry them in canola oil. Save the strips as a crunchy topping, then pour off all but a couple of tablespoons of the oil and start cooking the dish as you normally would. You end up with this wonderful, perfumed oil, redolent of sweet corn. Try it sometime. The soup could’ve been perfect but it was way too hot with 1.5 peppers. I added some corn to the soup, but I felt that it needed something more to make it feel hearty and wholesome. Maybe some green pepper and beans next time? My soup did not turn out as creamy and tomatoey as yours in the picture? It was way too watery and spicy to be a good soup. Somewhat disappointed 😟 PS homemade tortilla strips 100%! Sorry to hear that! The peppers can vary in size and heat so many that’s where the excess spice came from. Perhaps next time cut back a little? And yes, this soup is customizable. I think bell peppers, corn, and black beans would bulk it up even more! Hi! I bought all the ingredients to excitedly make this recipe tonight for a dinner party. It’s my first time using jackfruit, and reminding myself that I should have done a test run before, so that I didn’t face this problem. I bought frozen jackfruit thinking it would be fresher and easier to store leftover for next time. I saw the * for measurements of canned but didn’t know it was a must. When I opened it, it’s texture and look and taste is like mangos. It doesn’t shred, just mushes. I did some research afterwards to now learn that only unripe, canned jackfruit in brine can be used for “meat like” recipes ( is this true?). Really bummed not to know this before shopping. I absolutely LOVE all of minimalist baker recipes and recommend them to EVERYONE! Just wanted to share this though incase there’s someone else like me who doesn’t know this. Maybe worth mentioning in recipe too? I had no idea you could purchase frozen jackfruit! Thanks for sharing! Yes, canned is best here, not in brine! I made this tonight and it was excellent! I added black beans and one Tbsp of tomato paste! Thanks for sharing, Emily! Next time would you mind leaving a rating? It’s super helpful for both us and other readers. xo! I made this last night for my husband and I, it was my first attempt at cooking jackfruit and I absolutely loved it! I wanted to make it a bit heartier so I added a can of black beans and Trader Joes fire roasted frozen corn. I made a cashew sour cream to top it and it was incredible with avocado, cilantro and a squeeze of lime. This will most definitely be a weekly meal for us! Thank you! You have made our transition to a plant based diet 10x easier. my husband and i made this soup tonight for my parents and it was a hit! everyone really enjoyed it. not a single criticism. everyone loved how flavorful and complex the seasoning was without being too hot/spicy. we had tacos afterwards, and i prepared your quinoa taco meat. super full now. but adding black beans does sound nice.. thanks dana! We are glad to hear that, Carmen! Delicious! Will make again for sure. I did add 3 corn tortillas torn up to thicken the broth some. Added about half the can of chipotle peppers with Adobe sauce. A little kick, but nice. And then a couple handfuls of corn and black beans, as I was eating this as my main dish. Wow! Flavors are amazing. Thank you so much. Delicious! I added about half a cup of tomato soup to the broth and also a can of black beans for more substance. I apparently don’t enjoy jackfruit, the soup is a great flavor though. Thanks for sharing! Sub tempeh, tofu, or black beans next time! This soup is so delicious! I’ve never made anything with Jackfruit. It was so simple! I used 1 chipotle pepper, but scraped all the seeds out. I added 1 teaspoon of the Adobo sauce and it was just spicy enough to add heat to the belly! Definitely squeeze fresh lime on your bowl – it fabulous! I really enjoyed this recipe even though it turned out a tad too spicy with 1.5 chipotle peppers and just a little adobe sauce. It was really flavorful with the added avocado, lime, cilantro and chips. Next time, I will just add some of the adobe sauce as you recommended above. I followed the recipe to a tee, and I am wondering why mine didn’t turn out as “tomatoey” as the one in the picture. How much adobe sauce did you use? Did you by chance add another tomato ingredient for the photography to give it more of a red color? Thank you! Thanks for sharing! The red color came from the chipotles and the broth I used, which has tomato paste (Imagine brand). I made this tonight and it was great! I decided to bulk it up a bit by adding two thinly sliced carrots (I just can’t make soup without carrots!) and a can of black beans. It was excellent and I am so glad that I decided to make tortilla strips rather that use chips – they were so good! We had cilantro, avocado, black olives, and fresh lime juice on top – it made for a great dinner and was fairly quicky and easy! Thank you for yet another winner, Dana! You are the BEST! We are so glad you enjoyed this soup, Laurie! Thanks for sharing your modifications! This sounds amazing! 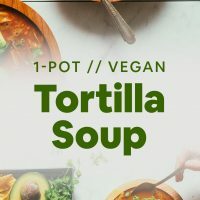 I just made vegan tortilla soup a few weeks ago, it wasn’t as flavorful as I thought it would be. But I had extra and froze it, we I reheat it I will try caramelizing onions and adding jackfruit. If I were to use fresh jackfruit would you use green or ripe? Hmm, I’d say green! Ripe can be quite sweet. I’m not sure I’m going to find those peppers here in UK what can I substitute with? Hi! You can get the chipotle from Mexican stores. Otherwise, you can do the soup without it. You can also add on the top fried strips of dried pasilla chili (as the original Mexican recipe dictates). And instead of cumin use oregano. Can use tofu or something else to replace the jackfruit. I don’t have jackfruit available in my area. Any suggestions? Absolutely! Tempeh or tofu (shredded or chopped) would work well here! Fantastic! I made this tonight with some slight adjustments. My local co-op didn’t have chipotle in adobo sauce, so I used the following recipe as a sub. Mix 1 tablespoon tomato paste, 1 apple tablespoon cider vinegar, 1 teaspoon chipotle powder, 1/2 teaspoon cayenne, 1/2 teaspoon cumin, a pinch of oregano, a pinch of garlic powder, and a pinch of salt. I added all of the sauce when this recipe calls for the peppers. It worked pretty well! Added black beans to serve for the additional protein. Amazing on this cold fall day! Has anyone tried this in a crock pot? Any idea how long to cook and on what level of heat? It looks so delicious! I think it would be wise to follow the recipe as written in terms of sauteing the onion and jackfruit first for color and to brown. Then add the remaining ingredients and cook on low covered for as long as desired. Adding a can of black or pinto beans could also be nice! I’m so excited to try this! In Calgary I found Cha’s canned organic jackfruit at Save-On-Foods. Used it for your pulled “pork” sandwiches and it was delicious! My goal is to have my family 50% vegan by the end of the year. Your recipes are making it SO easy! Hi It says add veg broth with onions and garlic and then add the jackfruit to dry it out, then add remaining broth. Is this an error if not how much do you put in first as all of it wont dry out the fruit surely? The first mention of broth is mean to act as oil oil. Feel free to replace with oil or water if desired! And the second mention is the full amount of broth for the soup. Hope that helps! In process of making this! Just happened to have all of the ingredients on hand :) Actually used a homemade chipotle in adobo from a friend. Tried to take the seeds out of the pepper, but it’s still turning out quite spicy! Any tips on how to tame heat?? Check your local Trader Joe’s for a can of jackfruit! I also added a can of rinsed black beans for a little protein! Very tasty so far! Thanks for sharing! We like throwing in some black beans before serving, too! To tame the heat try adding a very small chipotle pepper OR just use the adobo sauce and omit the pepper next time! Hope that helps. Funding good jackfruit is a struggle. Any suggestions on your favs? Trader Joe’s has canned jackfruit! I always have a couple cans in my pantry – my husband and I typically use two cans per recipe (for bbq jackfruit sandwiches or “carnitas” style for tacos). Yes, love Trader Joe’s or Native Forest! Also if you have an Asian food store available they often have jackfruit in a can. Make sure you get the one in brine not syrup. I agree, I can’t make anything with jackfruit, it just tastes terrible. I’ll take suggestions as well! Can I use canned jack fruit? Yep! That’s what we use. Trader Joe’s brand is good. Otherwise Native Forest is great! Used unsalted chicken broth, just one of the adobo chipotle peppers, and added poached, shredded chicken thighs. Thank you for sharing! Oooo yay! This looks great for our windy, rainy, early-winter weather here in Alaska! I already make something similar to this and would add that corn cobs make excellent broth! Whenever we have corn on the cob, especially if we fire roast on the grill, save those cobs to be simmered afterwards. Freeze the cobs if you don’t have time that day. I add corn kernels and any cooked bean or squash I have around for a 3 sisters vibe. This is a great autumn soup!